If you are looking for a watch that is a little different, consider an antique bracelet watch. Antique watches offer a wonderful way to combine a practical timepiece with a tiny piece of history. Every antique watch will have a little story to tell, and many old or vintage watches come complete with information about where and when the watch was made and even about the original owners. These small pieces of information bring an interesting dimension to a watch purchase, and make it that little more special than buying a modern watch straight from the shelf. When buying a vintage bracelet antique watch, it is important to buy it from a reputable seller. This is important when buying any old or vintage item, but particularly so when buying a watch that is to be worn for time keeping. While a watch that didn't work could make a great item of jewelry or be worn purely for decoration, most people require a watch to keep good time. Bracelet - the bracelet needs to be in good order. The connections between the links should be robust. Vintage and antique bracelet watches are usually held together with pins, and these pins should be fitted securely and not bent. A bent pin will stop the bracelet from fitting properly. Catch - the catch should be checked to make sure it is working properly. If there is any doubt the catch ought to be replaced, or if this is not possible, wear with a safety chain so if the watch catch does pop open the bracelet watch will not get lost. A safety catch can be fitted by many high street jewelers. 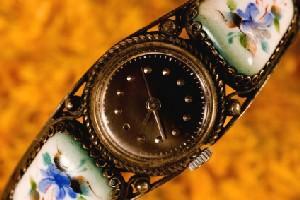 Watch Case - the watch case will naturally be old and reflect the wear and tear of many years. However, are the knocks and scratches within an acceptable boundary? Some wear and tear adds to the beauty of an old watch, giving it additional character. On the other hand, severe damage may weaken or disfigure the watch case. Watch Mechanism - an antique watch that is going to be worn as a time keeping device needs to keep good time. The seller should be able to provide information about the accuracy of the watch. There are many different types of watch mechanisms and it is important to discover what literally makes this watch tick in case it needs servicing or repairing in the future. Other - there are other aspects of buying an antique bracelet watch that will need to be checked depending on the watch type. Bracelets made from gold, for instance, should be hallmarked or stamped in some way that confirms that the metal is gold. Many antique watches will be made from solid gold and this will be reflected in the price, making it essential that you establish the quality of what you are buying. Some watches should carry identification marks. Antique and vintage watches can be bought from specialist antique watch stores, from general antique stores and online. One of the benefits of buying an antique watch from a specialist dealer is that the dealer is an expert in his field and will be able to offer detailed help and advice. This doesn't mean that excellent deals won't be found in other stores, although the level of advice and information offered may be less. When buying from a store, it is possible to handle and actually feel the quality of the watch. This is not as easy when buying online, and while some online stores offer unconditional money back guarantees the general rule is that you are buying unseen. It is also possible to buy antique or vintage bracelet watches from auction sites such as eBay.com. This can provide an excellent way to find unusual and hard to find watches and bargains can be searched out globally. There are, of course, also drawbacks and it is important to check out the seller's feedback before buying. This will let you know not only the seller's reputation, but also the types of goods that he normally sells. Someone who specializes in selling antique watches on eBay may well be an expert in this subject, however someone who sells general goods with only the occasional watch may not. A vintage bracelet watch will look wonderful and provide you with a watch that will give pleasure for many years to come, and might even become an heirloom to pass on to future generations.